In 2012, I closed a TEDxBelfastWomen talk with “We’ll get there”. In 2018, I find we may actually be ‘there’. It referenced my call to throw off the adaptive behaviours common to many on this island – our silence, passivity, self deprecation and shaming ways, in order to take our place on a global stage. In 2010, I co-founded a coworking space in Newry. The intention was to support the emergence of a more dynamic entrepreneurial ecosystem outside of Dublin and Belfast, on the border. Our contention was that the “peace process” had gone as far as it could go. What was then and now required for Ireland is a “prosperity process”. That required culture change. And for us to share a different vision of Ireland. From my vantage point on Carlingford Lough and the border, both Northern Ireland and the Republic were, as C.S. Lewis depicted them, a magical, medial place. A space in-between and one where opportunity abounds. Culture change is a tall order! It has been a hard road. Yet, the interesting thing about having a vision, setting an intention – and even failing from time to time, is that when you fail – you fall forward in the direction of your dream. So imagine my delight in 2016 – when the Centre for Cross Border Studies added this tag line to their Cross Border Social Innovation Conference – “Lagan to the Liffey”. The Emerald Valley facility had by then closed – but “from the Lagan to the Liffey” – our carefully chosen turn of phrase was designed, where innovation was concerned, to render the border invisible – and it lived on. We’d fallen forward. This week, I had notice of an event in Belfast focused on telling Northern Ireland’s story. Two things were heartening. I self-describe as an evangelist for Northern Ireland – both economically and civically. Economically in trying to drive home-grown innovation and inward investment by highlighting our opportunities and accomplishments. Civically in both America and the Republic of Ireland – in efforts to drive a change in both attitude and language. We are nearly 20 years on from the peace process – but nonetheless, many in both places remain unreconciled to it. Ireland 2.0 – America, try ‘Ctrl, Alt, Delete’ . The journalists on this panel will, undoubtedly, be less impatient than the tone taken with my American readers, out of touch with what Northern Ireland looks like 25, 50 & 100 years after their families emigrated. My point in these illustrations is not “I told you so”. It is to encourage. I’ve not been alone in writing and repeating these sentiments, and it’s not been to win hearts and minds. It was to support people who clearly felt the same way. To let them know they were not alone. And in time, to make it safe for them to speak up. Failing and falling forward was worth it! Robert Reich, Berkley Professor and former Labor Secretary under President Clinton has opened a series of lectures to the public. The course is called, In Focus: How to Ignite Social Change. This slide speaks to “The Three Elements” it takes to reach the tipping point at which social change happens. Thankfully, in Ireland we have reached that point! “Ah sure, you’ll never change it” was the language of hopelessness that had undermined us. in 2008 when 15,000 pensioners marched on Leinster House to preserve their entitlement to medical cards. In September 2010 with 100,000 rallying to protest the onerous terms of the bailout. In 2017 when 10-15,000 took to the streets to protest “water charges”. The populist genie was out of the bottle. Activism could clearly drive change. 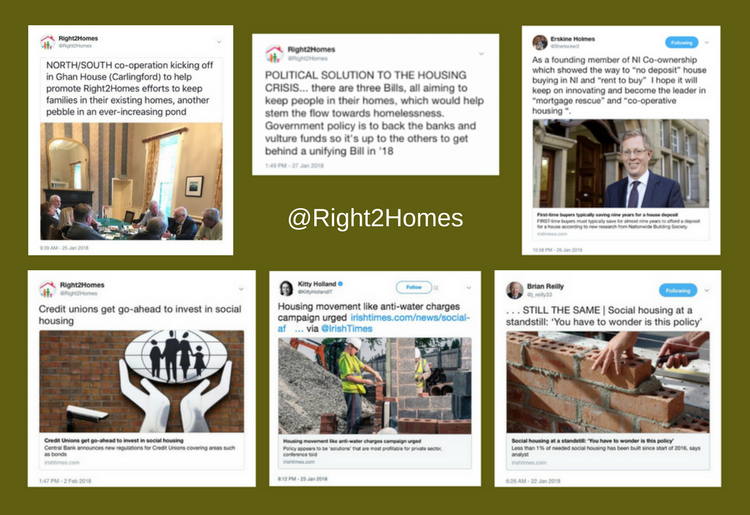 Inspired, in the summer of 2017, a group of activists sent out over 200 press releases, yet couldn’t get media coverage for a “National Housing Cooperative Bill” to be introduced on Dáil Éirann’s return in September. 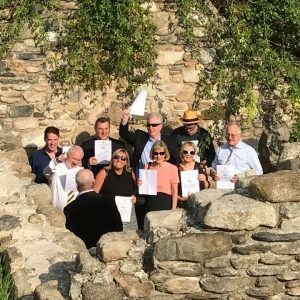 Undaunted, they then held a press conference at the Irish Hunger Memorial in New York City – the proverbial “33rd county”. They were joined by Cornell University Law Professor Robert Hockett and got the attention of homeless and housing activists there, academics, politicians, philanthropists and investors. And won their hearts, as in true Irish fashion, when the formalities had passed, music ensued. Imagine visitors to the memorial serenaded with an impromptu rendition of “I’ll Tell My Ma When I Go Home“. The Irish Central – a digital newspaper with a reach of 3.5 million unique views a month covered the story, and the media in Ireland took note. More and more stories began to surface here, “broad public knowledge” of “the gap between the ideal and real” led four brave individuals to join Financial Advisor Padraig Kissane in testimony before the Oireachtas Finance Committee – ultimately breaking the news of what is now estimated to be 33,000 tracker mortgage holders cheated by their banks. Clearly the banks were counting on our silence, passivity and shame. No longer. Housing rights advocates and financial reformers are on the move. New legislation is to be introduced and the Oireachtas Finance Committee and it’s Chair TD John McGuinness are holding banks to account. He and TD Pearse Doherty have called on Finance Minister Pascal Donohoe to support class action legislation because “the culture won’t change until the banks are prosecuted” – even though Ireland does not yet have a mechanism to bring one. « Nothing changes until we do!